Fight against genetically modified (GM) mustard is all set to reach streets following a massive dharna at Jantar Mantar in Delhi under the banner of Sarson Satyagraha, in which farmer unions, farm workers unions, trade unions, industry representatives, scientists, women's organisations, right to food campaigners and other civil society organisations joined hands. The protest saw the participation of 150 organizations from across India, including 29 national level organizations and alliances ranging from the Left-wing All-India Kisan Sabha All-India Agricultural Workers’ Union, All India Trade Union Congress, and the National Federation of Indian Women, to saffron-supported Bhartiya Kisan Sangh and Swadeshi Jagran Manch. It also saw participation by the Confederation of Beekeeping Industry of India, the National Right to Food Campaign and leaders from Congress, Aam Aadmi Party, JD(U), CPI(M), CPI, and DMK. 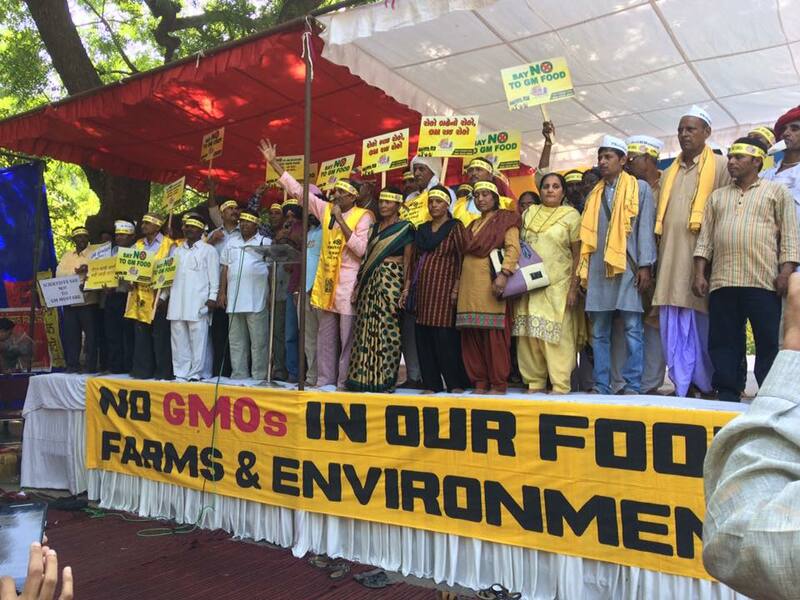 The protest was organized followed decision of the Genetic Engineering Appraisal Committee (GEAC), the nodal agency for GM crops under the Ministry for Environment, stopping all public feedback process on bio-safety studies of GM mustard, suggesting that the government was in a hurry to get the HT GM mustard approved in time for the November season. Farmer leaders from across the spectrum, including Hannan Molla and Vijoo Krishnan of the CPI-M, , Rakesh Tikait of the Bhartiya Kisan Union, Rampal Jat from Rajasthan and Badribhai from Gujarat warned that if the government doesn’t listen to farmers’ voice and stop GM mustard, they would step up the fight and take to the streets. Insisting that GM would lead to agricultural distress and farm suicides, Bihar chief minister Nitish Kumar, in a video message, shown at the dharna, called it a “big hoax is being played on farmers”. He reminded the Prime Minister that Bihar has always opposed GM crops – whether Bt brinjal or field trials of GM maize. Delhi minister Kapil Mishra wondered wy the Modi government was not listening to even its allies such as Bhartiya Kisan Sangh and Swadeshi Jagran Manch, pointing out the Aam Aadmi Party-supported Jashn-e-Sarson festival of mustard. Congress MP Gaurav Gogoi from Assam said the Satyagraha is not against science, and that the farmers should be respected as practising scientists. He questioned why thousands of farmers coming to Delhi are not getting appointment with the Prime Minister but corporate CEOs get to travel along with him. Amarjeeth Kaur of AITUC and, if GM mustard is adopted on even a low 25% of mustard cultivation area in India, this will result in an approximate employment loss of 4.25 crore person-days in rural areas. “This will have impact on major mustard growing states including Madhya Pradesh, Rajasthan and Haryana which are BJP-ruled states”, she added. A representation of the dharna participants met officials of the PMO, environment minister, agriculture minister, health minister, commerce minister, minister of woman and child development, and told them that if they do not listen, the mass organizations would begin all-India agitations.